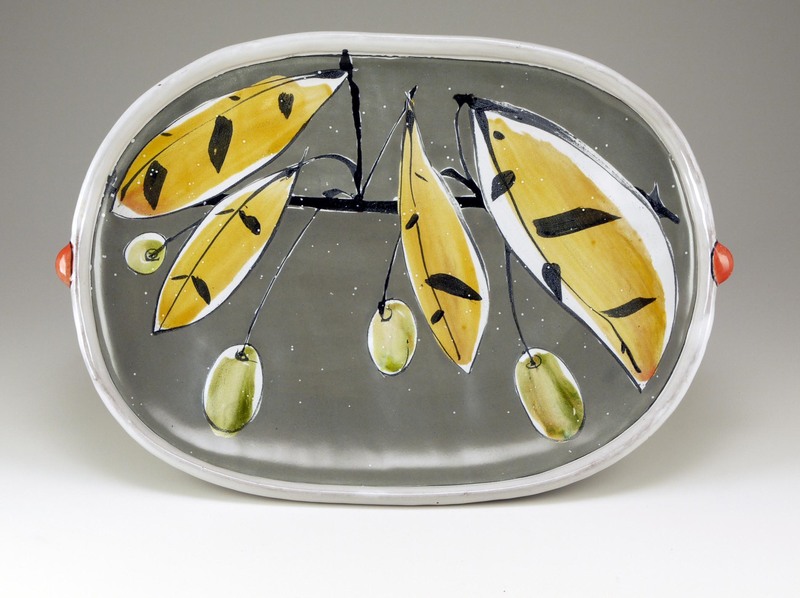 Check out 10 more of the 50 plates for sale to benefit NCECA’s 50th Anniversary, selected by Simon Levin and generously donated by 50 artists who believe in NCECA’s mission. 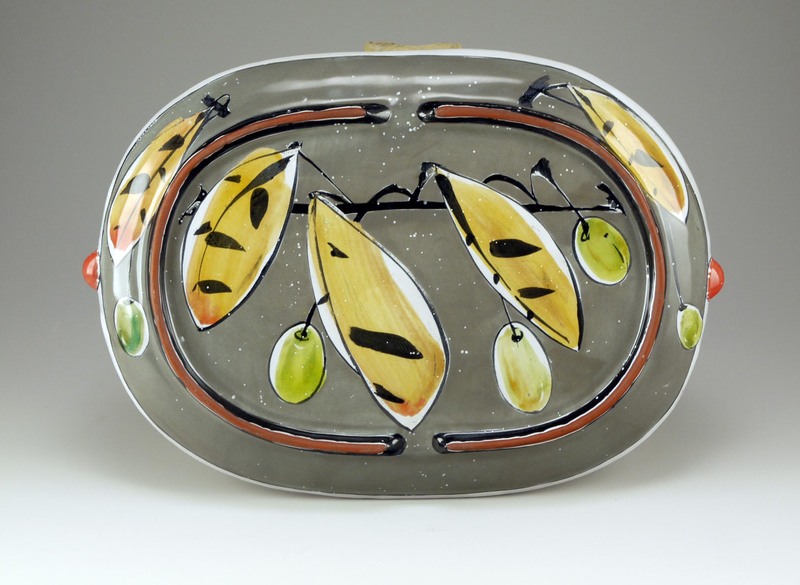 Although several of these plates have already been sold and are enjoying their new homes, you still have an opportunity to own a beautiful piece of artwork while simultaneously benefiting NCECA. Click on any plate image for details. 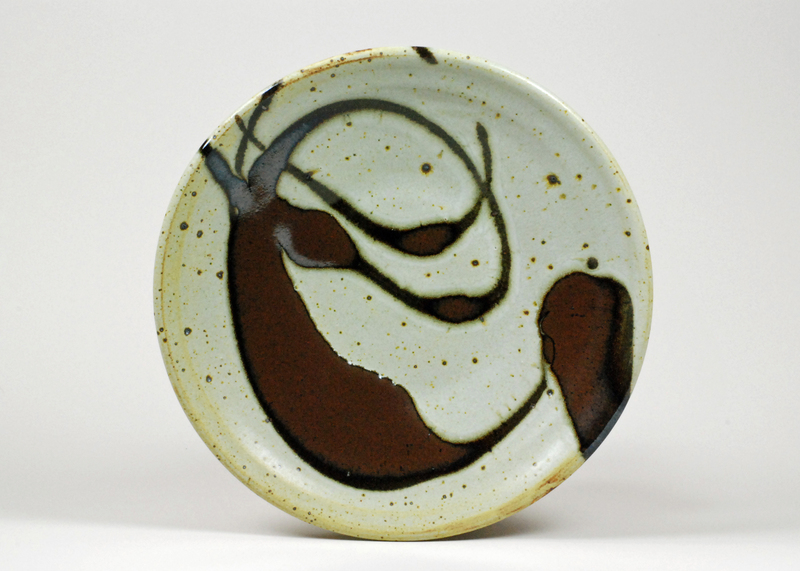 Honeysuckle Plate, 2012, Yixing Stoneware fired to Cone 6, H 0.75 in. x W 6.5 in. x D 6.5 in. Thrown and decorated with porcelain slip, under glaze and glaze. Ben Carter is a studio potter, workshop leader, and social media enthusiast based in Santa Cruz, CA. He received his BFA in studio arts from Appalachian State University, and his MFA in ceramics from the University of Florida. His professional experience includes being an artist-in-residence at Anderson Ranch Arts Center in Snowmass, CO, the Archie Bray Foundation in Helena, MT, and the Ceramic Research Center Guldagergaard in Skelskor, Denmark. From 2010-2012 he served as the Education Director of the Pottery Workshop in Shanghai, China. He has lectured and presented workshops at universities and craft centers in the United States, China, Australia, and New Zealand. He continues to exhibit across the United States in invitational and juried shows. In addition to his studio work he is the creator/host of the Tales of a Red Clay Rambler blog and podcast, where he interviews artists about their craft, creativity, and lifestyle. To view an online portfolio of his functional pottery please visit www.carterpottery.com. “Carolina Wren Lunch Plate”, 2014, stoneware covered in flashing slip, hand painted with underglaze. Fired in a propane fueled salt kiln. Cone 10. Diameter 8” x .75”. Lunch is one of my favorite meals. I don’t get a lunch time at school, so lunch at home, looking out at my garden, surrounded by handmade objects is an oasis in the day. Choosing a plate and cup gives me a chance to weigh my mood and respond to it. This gives me a feeling of potency and creative participation, and allows me enjoy yet more than the food. It’s a chance to be queen in my own domain, and visit vicariously with other creative people. What could be better as a lunch date? Fred Herbst earned a BFA in Art from the University of Wisconsin at Stevens Point. He then attended the University of North Texas and earned a MFA in Ceramics. He has been a professor of art at Corning Community College since 2000. My utilitarian work often references the organic shapes found in the gardens I have tended throughout my life. A variety of vegetal forms have become the inspiration for the jars, bottles, plates, teapots and other functional forms I create. In my studio, I imagine the natural beauty and bounty that will someday fill my pots and the user. The scale of my functional work is modest in order to encourage thoughtful consumption. Regarding technical process, atmospheric firing and the surface alterations I often create result in dynamic surfaces that add another layer of interest to the objects. The anagama and “glassagama” kilns I use were designed to allow for the most direct effects on the work. Clay bodies and specific shapes are selected for particular zones of each kiln to maximize the potential for dynamic surface patterns and coloration. Each piece is loaded in the kiln with concern for how the flame and ash produced during the firing will complete the long journey from idea to object. Jennifer Allen received her Bachelor of Fine Arts from the University of Alaska, Anchorage, and her Master of Fine Arts from Indiana University, Bloomington. In March 2008, the National Council for the Education of Ceramics (NCECA) named Jennifer as a National Emerging Artist. Among other awards, she was the recipient of the 2006-2007 Taunt Fellowship at the Archie Bray Foundation in Helena, MT. In addition to keeping a home studio, Jennifer currently teaches a couple of ceramic courses at West Virginia University in Morgantown, WV. The luncheon-sized plate can easily be as nomadic as a coveted coffee mug: not always needing to land on a table surface to be used. Since it is the type of plate that is often gripped in a hand or rested in a lap, it is important to be as thoughtful as it is beautiful and useful. The plate I chose for the exhibition is intended for daily use. The textured rim gives clues to the history and tactility of porcelain while the decorated center nods to textile design and floral motifs. My artwork preserves the vanishing Minnesota landscape through abstract imagery on functional pottery. This imagery consists of our threatened flora, fauna and native landscapes. I fire this work in a wood or soda kiln. This process creates a very durable product with great variation and depth. The use of these pots enables the public to appreciate the natural world around them in their daily lives. Often I find myself making pieces that offer more surface area to decorate. Plates and platters are the most suited for this endeavor. On them I am free to draw with stains, glazes and wax, creating the layers and abstract images that I love. NCECA has always offered me a break in the year to catch up on what is happening outside my region, a breath of fresh air and a meeting of old friends from the past. It is a welcomed educational experience before we all go back home and immerse ourselves in studio work. Steven Young Lee is a contemporary artist working in ceramics and mixed media. He is currently the Resident Artist Director of the Archie Bray Foundation for the Ceramic Arts in Helena, Montana. He received his MFA in Ceramics from the New York State College of Ceramics at Alfred University. Steve has lectured and taught extensively in North America and Asia and in 2004-5 lived and worked in China while on a cultural and educational exchange. In 2005-6 he was a visiting professor at Emily Carr Institute of Art and Design in Vancouver, B.C. In March 2013 he lectured and participated on a panel, “Americans in the Porcelain City,” at the Metropolitan Museum of Art in New York. Also in 2013, he was invited to participate in “New Blue and White,” an exhibition at the Museum of Fine Arts in Boston that featured contemporary artists working in the blue-and-white tradition of ceramic production. His work has been included in numerous museum and private collections and has also been exhibited at the Duane Reed Gallery (St. Louis), Ferrin Contemporary (Massachusetts), Foster White Gallery (Seattle), and the Stremmel Gallery (Reno). My work investigates how individual perceptions are formed. I am fascinated by the effect of environment, traditions and superstitions on our perspective of culture. I like to question and challenge preconceptions that can reshape our sense of identity. The pieces I create appropriate elements of form, decoration, color, image and material that are distinct to a particular culture or history. The viewer is left to construct the context and narrative of the object or image based on his or her own perspective and experience. I strive to create work that has the ability to transgress boundaries of all types—geographic, cultural, contextual and visual. Kevin was born in Philadelphia, but grew up mostly in Cleveland, Ohio. He is a full time wanderer, maker of exquisite objects. He gets his smarts from the streets but also managed to learn a thing or two at a couple of fine educational institutions. He holds a BFA from the Cleveland Institute of Art(1994) and did graduate work at the University of Florida, in Gainesville, Florida(2003). From there he participated in several short-term artist residency programs, including the Clay Studio, in Philadelphia and Watershed Center for Ceramic Arts, in New Castle, Maine. He was also a visiting artist at Louisiana State University, in Baton Rouge and did a two year residency at the Archie Bray Foundation in 2008 through 2010, in Helena, Montana. His most recent residencies (2013) took him to Vallauris, France and to C.R.E.T.A. in Rome, Italy. Kevin currently maintains a studio in Cleveland, OH. 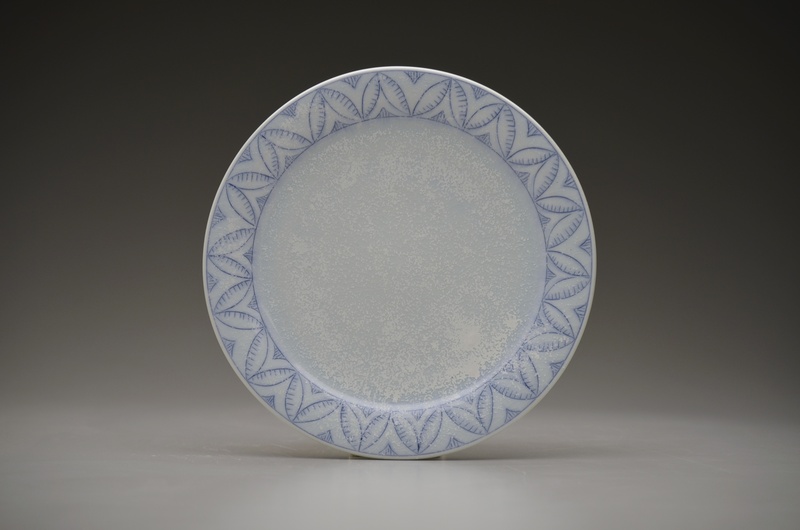 Exhibiting both nationally and internationally, Kevin has exhibited as far away as Jingdezhen, China. The vivid passionate ardent fervent articulation of the ordinary. Primarily I think of myself as a storyteller. As with any good storyteller I use a mixture of truths, exaggerations and myths. Some of my favorite inspirations for stories are: existentialist thought and food. Lunch Plate, 1x9x9, Wheel-Thrown Red Earthenware with slips applied Soda fired to Cone 3. Form and Line drive my making. Line accents the changes in direction of rims, feet and form. These lines are physical and engage the user, but also serve to break up the pot visually. Formally my work has volume, it speaks of generosity. I respond to each form, as it is taken off the wheel or hand built, trying to be sensitive to each pots proportion, weight and gesture by working in a series. Form communicates a pots gesture; it speaks of utility, my pots reference common shapes and engage ones imagination. My pots are minimal and are rooted in the traditional Minnesota pottery I grew up admiring, I want my work to be paired down to the essentials and be truly useful. This brings emphasis on the fundamentals of pots. Interiors contain visual depth and are continuous with no obstructions for easy use. Exteriors are a place to make more physical statements. I discovered clay in college and began making pots in the 80s in Venezuela, where I was born. In 1981 Warren MacKenzie came to teach a workshop and I was assigned to be his assistant, lucky to be in the right place at the right time. Over the years Warren graciously shared his studio with me in Minnesota where for a month every summer I honed my making skills and observed how he ran his pottery. Living with him and his collection of great pots, old and new, I was immersed in the spirit of this ancestral, vital endeavor. This experience helped define the philosophy and approach to craft that continues to ground my work today. In 2005 my family moved to The St. Croix River Valley in eastern Minnesota to make a new home and start a pottery. I make utilitarian ware full time and fire in a reduction glaze gas kiln and a salt/soda kiln. I sell from the studio showroom, my website, craft fairs, a farmers market and several stores and galleries. I participate as a host studio in the St. Croix Valley Pottery Tour each May and host a fall sale in September. I fell in love with clay in the 70s, every waking moment consumed by the potter’s wheel and the unpretentious beauty of old pots described in A Potter’s Book by Bernard Leach, a champion of pottery traditions of East and West. I knew I wanted to be a part of this historical sweep of traditional pottery. In Venezuela I came across the baskets, pots, weaving, and woodwork of native people. To see their beautiful objects in everyday use was a revelation. It was not only the handwork I loved but also how these pieces brought people together as the focus of almost every activity. Integrating my pots with daily life remains an ideal. The significance of a simple plate is not diminished by the fact that it dwells more comfortably on the dinner table than in a museum. I believe the value is enhanced and the creative process culminates in its useful presence in our lives. Through our use and appreciation the piece becomes complete. Tom Jaszczak Lunch Plate, 1x9x9, Wheel-Thrown Red Earthenware with slips applied Soda fired to Cone 3. Ben Carter Honeysuckle Plate, 2012, Yixing Stoneware fired to Cone 6, H 0.75 in. x W 6.5 in. x D 6.5 in. Thrown and decorated with porcelain slip, under glaze and glaze. Kyle Carpenter “Carolina Wren Lunch Plate”, 2014, stoneware covered in flashing slip, hand painted with underglaze. Fired in a propane fueled salt kiln. Cone 10. Diameter 8” x .75”.